Robbie Cullen sent in this report and pic this week. Debbie Hoffman, from the USA, had never heard of kite fishing at all and in total disbelief she went to Uretiti Beach to see what it was all about. Despite being over 40 years of age and living near good fishing areas, Debbie Hoffman had never caught a fish until her visit to Northland. Using Robbie's special salted mullet for bait they put out two sets and caught three pan sized snapper, three good size gurnard and a kahawai. Debbie was very pleased with the catch. Debbie is from Seattle, Washington and she insisted that she have her photo taken with the kite and the catch, to show off to all her friends back home. As you can see, she absolutely enjoyed herself to the max! With weed and unfavourable wind the conditions haven't been good for Uretiti on the east coast lately. So instead of kitefishing I have been checking out the netting in the upper Kaipara. The area has been alive with mullet and kahawai which have been easy targets and I have been able to replenish my bait supply via netting. Some of the kahawai have been quite large and I have smoked a few of the bigger ones. I like to always have plenty of bait on hand as you never know when a good kitefishing wind will rise. I have found the best way of preparing mullet and kahawai for bait is to scale, fillet and then cut it up into bait -size strips. I then put it in an ice cream container with either rock salt or sea salt and tuna oil. Not only does the pre-prepared bait keep for a long time, it becomes very tough and stays on the hook very well even in areas where crabs are a problem. It is important to use an air-tight container with a tight fitting lid to seal the contents. I always store my bait in the freezer even though it would last for weeks without freezing. The wild sea conditions and the howling wind settled for a few days so at last we have had some fishable days. Over last weekend a few kites and a couple of kontiki rigs took advantage of the break in the weather and caught a heap of big gurnard and a few spiny dogs. The spiny dogs have only recently returned to our bay, they prefer the cooler water, which has recently arrived. A variety of shark species spend winter in close down here and I can remember a few years ago in June I caught three six foot plus grey sharks one evening on a surf casting rod. They certainly took some landing! Commercial Cray Fishers are still going well although their catches are starting to fall. The crays are still in close to the shore, so still worth a trip at low tide to throw a pot in. 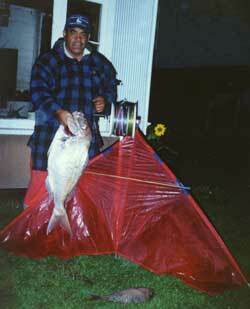 We have decided to run a Kahawai Fishing Contest from now till the 28th October 2002. All kahawai must be weighed in at the Shop to be eligible. Prize giving will be on the 28th October at the Porangahau Beach Bait & Tackle Shop. Prizes will be given for the 5 heaviest kahawai, I will give more details on prizes next week. Don't forget if you are in the area and have an hour spare, come and watch the Paul's Kite Fishing Video, we will even give you a cup of coffee. We went up to Te Arai Pt last Sunday to wait for the south westerly change but it just didn't happen. Luckily we had taken our surfcasting gear just in case. We caught nine decent sized Kahawai in an hour. Just shows how good the place is even in the wrong wind conditions. Keep up the good reports. This is a choice spot - publics loos and friendly locals - fisheries inspector has an old red Datsun and will come and see you but he is a good guy. We spent two days fishing outgoing tides here with a Dropper Rig. Initially we encountered problems setting due to horse mussels until we removed most of the weight from the hook section. The locals reported good catches from boats close inshore, as well as from a torpedo long line launched regularly from the beach. However the days we were there it was very slow with only pickers and the odd small fish landed. We used squid for bait and fished 1000m out. All the bait was stripped from the hooks after 20 minutes and we put this down to there being plenty of pickers. The wind was a southerly of 20 - 25 knots but there are several calm spots in wind shadows on the way out , this is due to the wind coming over the hill. Once you get about 500 metres out though, the wind fills and the pull really comes on. I am hoping to try fishing the incoming tide there this weekend as the outgoing is not ideal in this area. Facilities including toilets for whanau! Paul has offered me the chance to get the maps organised which I am doing and will advise soon. 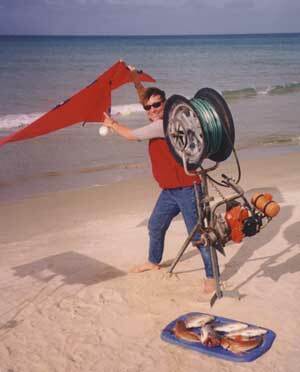 I hope that everyone will help out the kitefishing brotherhood and add spots as they find them. Talking of the brotherhood, I noted several kite fishing supply shops at the boat show with many supplying copied and imported gear. Personally I will always buy my gear from Paul's because he is the one who has done all the research and development on the methodology - he has invested the time and the effort and he deserves to get rewarded for this and also for the quality of his solutions, and for the enjoyment his efforts have given us. This is a fantastic idea that will take the co-operation of kitefishers around the country to succeed. As soon as we have a series of maps we will enter the screeds of information we already have on hand. We will need to come up with a straight forward, easy to follow style which will include icons on the map which depict the best rigs for the area, best baits, best tide to fish, best wind conditions and what you can expect to catch there at different times of the year. I have been kite fishing for a couple of years at least. I have kitefished all over the North Island from North Cape to Napier on the east coast and down to New Plymouth on the west coast. My biggest problem is when I travel from Auckland to where I want to fish I leave home very early in the morning. When I get to my destination the wind can sometimes be blowing the wrong way. Is there anyone that receives this newsletter, living on a beach suitable for kitefishing that I can call or e-mail to find out which way the wind is really blowing. I have found that you can't always count on the weather forecast. Keep up the good work with the newsletters, I find the info really handy. Photo Above : Doesn't time fly, it's been a bit longer than a couple of years, here's a file photo of Willie Kipa with a 27lb Kaipara snapper taken at the top of Muriwai Beach on 27th May 1992. Saturday 10th June, Miranda beach. It was a light westerly and I got my kontiki out. There were also two kites out a little further down the beach. We left our line set for an hour or so on dusk and hauled in our 25 hook set just after dark. Not a single bait was touched. The two kite longlines did no better. Does anyone know where all the fish went? If anyone else has been in this area recently please drop a report in and let us know if you had any better results. That means only one third of the windage and one third of the weight your kite has to lift and tow. Get more hooks further out in lighter winds than you ever thought possible. 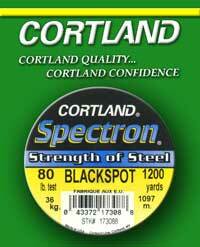 Get 1200 yards of 37 kg line on your Penn 9/0. This line normally retails for $389.95. Our price is ONLY $ 195.00.